Thread: First DCC/sound install: Can I test sound before connecting loco? I am about to embark on my first DCC install... a Tsunami 2 Steam 2 sound decoder "hard wired" into a Bachmann Spectrum USRA short tender, which will then be paired with a Bachmann 4-6-0 I just received from Mr. Moose. I have "stripped out" the new tender to make room (the factory PC board had to come out to make room for the decoder), gathered together all the components I (think) I need, and practiced my soldering. Now just need to work up the courage to start cutting wires and soldering. But first, a question or two..
My plan is to install everything into the tender, and have it ready to go, before I cut the old tender loose from the loco... basically trying to minimize the loco's down time. 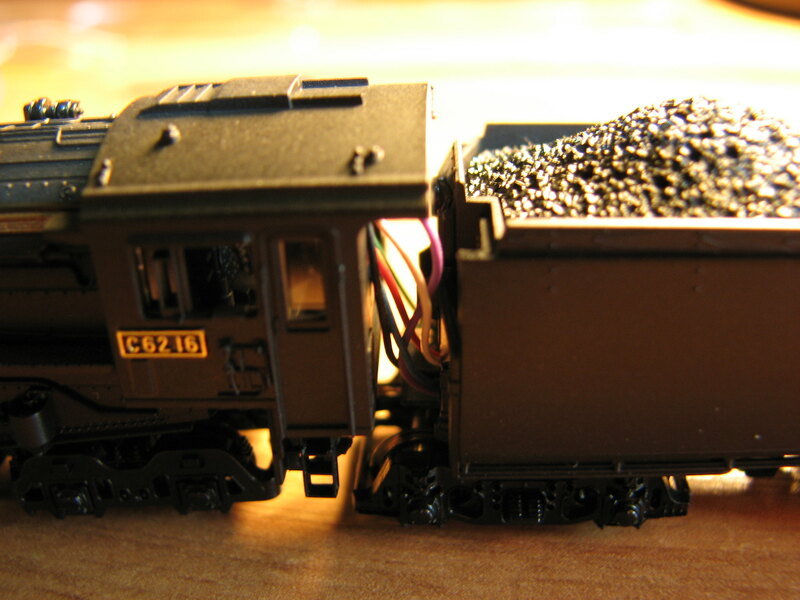 I will be using a 6-wire mini-connector between the tender and the loco (actually, in the tender, I think) to make it easier to disconnect the tender in the future.The tender will soon be converted to oil... so I can't fire the speaker up thru the coal load. It would be hard to disguise the sound holes in the top of the oil bunker. There is no room to mount the speaker firing down thru the floor... insufficient vertical clearance for the speaker with the decoder sitting above it. So, I plan to mount the speaker vertically in the tender, directing the sound forward towards the loco, thru a series of sound holes drilled in what will be the front of the oil bunker. Altho' the sound holes will be visible, I think that is the LEAST noticeable place I could put them. I'm pretty sure I will have room to mount the stay alive capacitor that came with the decoder behind the speaker in the oil bunker. I'd welcome suggestions if anyone has other solutions to the speaker/sound direction... What would be smallest recommended size for the holes? I was thinking of ten to twelve holes ~1mm diameter... is that too small, too few? But the real reason I am posting is to ask: Is there any reason that I couldn't/shouldn't test the sound install and confirm that it works before I actually hook everything up to the loco. The new tender will have 8 wheel pickup, and I thought I might just set it on the track, select the default loco 03, and blow the whistle and/or ring the bell to make sure they work before I cut the loco loose from its current tender... I can't see why that would harm the decoder (tho' I think I read somewhere you often can't program a decoder w/o the motor connected). I plan to take pictures along the way (already have some of the stripping down of the tender), and will post them once I have things working. Testing like that should work, it won't hurt the decoder. I agree. But just to be safe re: the decoder, I would always use a resistor to simulate the motor load. I use to test the decoders being them MRC, zimo, digitrax or loksound. On Drop-in decoders i just connect the wires on pick up, no motor. Is no issue with motor is not there. You will just test for couple of minute, not half hour. Is good to test before you mount, i found in the past cold soldering or bad soldering from factory (specially on Chinese brand MRC and Digitrax). Moose wonder if you'll need to drill holes in tender shell. The best practice is to ensure you use a quality speaker & enclosure (see "sugar cube" speakers @ SBS4DCC.com or similar). There's an opening in the shell where the locomotive wire harness passes through it that may be enough of an opening to adequately hear the sound. It's no need to drill holes in the tender (not even in the coal load) Sound will find a way out of the shell without problem. Like Moose said, just buy a good quality speaker with enclosure, the biggest you can fit in the available space. Sugar cube 11mmx15mm from Loksound or the smaller 8mmx12mm from SBS4DCC or Zimo. I'm going to try to fit in an 11 x 15mm sugar cube from SBS. I have it wired thru a TCS microconnector to the decoder, since the speaker will likely be attached to the shell and the decoder to the tender floor. This will allow me to completely remove the shell if needed, w/o unsoldering anything. It also makes it easy to swap out the speaker for a smaller one, if needed. I'll hold off on drilling holes until I hear how it sounds. I won't get to work on the oil bunker for a few days and have already removed the coal load, so the whole top of the tender will be open til then. Hopefully, I'll have good news to report later today. Shell is on, and sound is on! Maybe I'll be brave enough to swap tenders tomorrow! You don't need holes for sound egress. Tender shells are not air tight. There are holes everywhere that will leak air (and sound). Plus no holes gives a pleasing slight reverb to the sound, and emphasizes the lower-midrange, which makes the absence of any true bass less noticeable. Mount the speaker so that it fires into the open space in the tender (e.g., firing up toward the top of the tender shell). No holes. Swapped tenders today... I finally gave up on the idea of including a microconnector in the leads between loco and tender. Connectors don't bend, and there just wasn't enough room to make the wires do what I wanted (more on that in a minute). Maybe with a little more experience, I could have figured it out. Instead, I ended up hard wiring the tender to the loco, which is how it started out anyway. Got the wires stuffed in (think they're too long), and the speaker (John C., right now I am planning on speaker baffle sitting right up against the top of the oil bunker-to-be, firing down into space occupied by wires, the capacitor, and decoder... but I can play with it and see what works best). First, I may have left too much extra wire between tender and loco, and am having trouble getting just the right amount and position. The loco is derailing at a turnout that it didn't have problems with before, and I can see the wires between the loco and tender have shifted around. I'll have to work on that... might need to shorten the leads a little. If you can not fit 11x15 speaker, try with 8x12mm also from Brian. Bachman in small movie posted, have a small 8x12 Zimo, and sound great. Just glue the speaker on shell, with CA glue, but seal perfect, to separate the inner side from out. I use to glue with CA and seal with liquid electrical tape. For wires, try to make a small loop between locomotive and tender, using the smallest wire, and test for flexibility and for any binding. Here a photo more clear and with wires painted black. Wires have space to move free in the cab and gap between tender and locomotive.